The word is “Urban” at Illustration Friday, and Lana is nothing if not an urban girl. She is currently going to fashion design school in the Midwest, and longs to visit New York and the legendary Mood Fabrics. This wig is her favorite from a collection of twenty-two wigs (though last week it was the silvery pale blue mohawk). 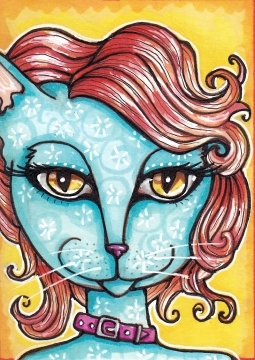 This entry was posted in ATCs and ACEOs, Copic Markers, Progression Photos and tagged aceo, atc, cat art, Copic Markers, illustration, Illustration Friday, pen and ink on April 9, 2013 by The Beast Tender. Lana is one cool cat! Glad you’re feeling better. I would love to be a quirky urban hep cat. I love the details in your illustration and marvel at your skill in the medium! Lana is supercool! She reminds me of my 16 year old niece, living in Seattle. Sweet and urban. Get well soon! She is a cool cat Cinders…I like this ‘comic’ style character!!!!!!!!!!!!!! She is definitely a cool cat!! She is ooooozzzing coolness!!! I love her eyes. You have a way of making them glow -they draw me in! Glad you’re on the mend! I’m following your work for a while and want to let you know I love it a lot. It’s so collorfull. Thanks for sharing all your nice work. She sure is cool…..love the textures/designs on her face. Her amber eyes almost glows! And the color scheme is vibrant! Glad you are feeling better….hopefully it will warm up soon and the “sick” season gone away soon too! Thank you! I bet she would love your little dog! I think Lana is pretty cool as well, love her wig. You could do all 22 of them! I wondered what you would come up with for Urban, and this is great. Glad to hear you are on the mend. Thank you, yes! I will try to be careful. Ugh, what a season! Lana Del Kitty, wow! Love her cool expression and the decorative skin/fur! Lana’scool, Cindy, for sure. Two rounds of antibiotics? Wow. You were sick, girl…. I am so glad you feel better. Love Lana’s hairstyle… I’ve been trying to make mine do that for years! :-) Glad you are finally feeling better! Glad you are feeling better, Cindy. Does she have as many wigs as Dolly Parton? Lana! Fashion school in the midwest, huh? I love it. I love her!